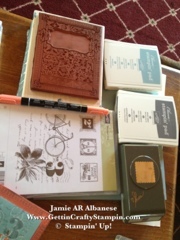 I love my various classes in Stampin' and craftin'. It nurtures my heart to create something with my hands! The ladies in my Parks and Rec class wanted to learn some coloring techniques and brayer techniques... The Crayon Resist, Masking and Brayer techniques were a must to work with! I nabbed my Color Coach and went outside my usual color profile and started with our InColor (thru this year only!!) Calypso Coral paper. The CC (Color Coach) suggested Baja Breeze and Basic Grey as compatible. Here I stamped this Postage Due stamp set stamped with Basic Grey on Very Vanilla paper allowed for me to POP this flower out and tech the Masking technique. I used out Calypso Coral Stampin' Write Marker to color in the flower. I then used a White Crayon to highlight some of the bike and script lines. I stamped the flower on a sticky note and cut it out to make a cover that will mask the flower. I loaded the Brayer with Baja Breeze in and covered the paper. Removing the mask the flower now POPs out and the crayon resisted the ink allowing for the bike and lines highlighted to pop out! Love the Resist Technique!! 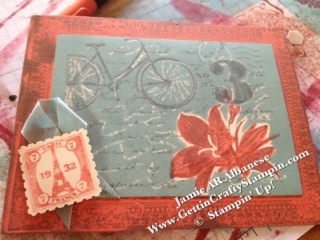 I used the Ex Libis background stamp to create the frame on the Calypso Coral card base. I then layered the Post Card... I like that this can create a frame! Who knew?!?!! 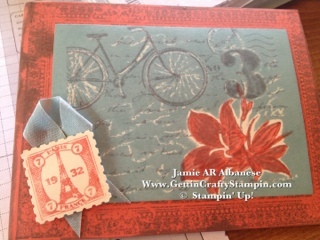 I punched out the Paris stamp and with the Postage punch. I snagged some Baja Breeze seam binding ribbon and our lil adhesive backed pearls to create this lil embellishment! A fun and technique loaded card. It's out of my comfort zone in color but its fun to think outside the box! How would youoooo load a card with technique?? I hope you feel inspire to think outside of the box! This might be outside your comfort zone, but you did a great job! This is a beautiful card! One of these days I'll learn to use my brayer properly. I've used it, but like you, it's out of my comfort zone.